In the afternoon of this Wednesday of August there has been a forest fire, which has been stabilized. It took place at Cape Finisterre, at the end of the pilgrimage route from Santiago de Compostela to the town of Finisterre. 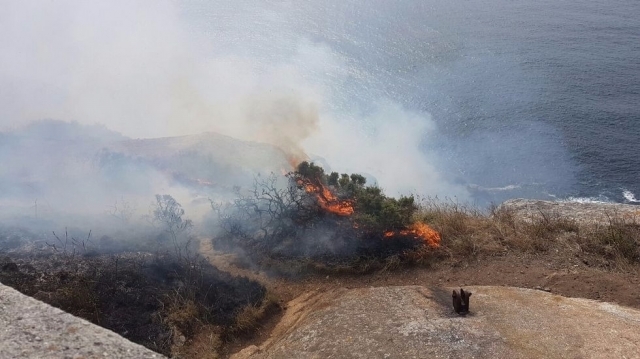 Civil Guard agents have closed the facilities of Finisterre lighthouse and vacate the environment for safety before the great cloud of smoke that has been caused and waiting for power control. The fire was caused by a couple of Italian pilgrims who has already been identified by the Civil Guard have already been arrested. Allegedly they would have thrown a boot burning, which would have caused the fire. At Cape Finisterre recent years have been taking some facts of this kind related to the "tradition" of burning clothes by some pilgrims at the end of the Camino de Santiago, an activity that is prohibited by the town council. In this link you can see how firefighting services try to smother the fire. Es increíble!! En el camino hay zonas enormes arrasadas por los incendios!! Nosotros vivimos uno cerca de Torres del Río, fue terrible!! No creo necesario hacer el "rito" y correr el riesgo de provocar un incendio. ¿Arrojaron una bota ardiendo? ¡Estamos locos!